I have spent a lot of time over the past decade-and-a-half talking about nanotech and nanoparticles. The often unexpected properties of these tiny specks of matter are give them applications in everything from synthetic antibodies to fuel cells to water filters and far beyond. Recently, for the first time ever, scientists were able to watch the particles grow from their earliest stage of development. Given that the performance of nanoparticles is based on their structure, composition, and size, being able to see how they grow could lead to the development of better growing conditions, and thus better nanotechnology. The research was carried out by a team of scientists from the Center for Nanoscale Materials, the Advanced Photon Source (both run by US Government's Argonne National Laboratory) and the High Pressure Synergetic Consortium (HPSynC). The team used highly focused high-energy X-ray diffraction to observe the nanoparticles. Amongst other things, it was noted that the initial chemical reaction often occurred quite quickly, then continued to evolve over time. The research was recently published in the journal NANOLetters. Here I go with another moon-themed post. Seemingly, my son's fascination with our closest neighbor is starting to rub off. My son and I talk a lot about space exploration. And, it's more than 40 years since the first human set foot on the moon. So where are all the robot space explorers? While rovers like those that have been trawling the Martian surface in recent times could properly be called robots, and machines like the legless R2 (seen in the video below) are heading to space, these don't match the classic science fiction image of a bi-pedal humanoid bot that we've all become accustomed to. Now a Japanese space-business group is promising to set things in order by sending a humanoid robot to the moon by 2015. Japan's Space Oriented Higashiosaka Leading Association (SOHLA) expects to spend an estimated 1 billion yen (US$10.5 million) in getting the robot onto the lunar surface. Named Maido-kun after the satellite launched a aboard a Japan Aerospace Exploration Agency (JAXA) HII-A rocket in 2009, there appears to be no clearly defined mission for the robot (apart from getting there). It's hoped that Maido-kun will travel to the moon on a JAXA mission planned for around 2015. Achieving the feat would certainly be another feather in the cap of Japan's world-leading robotics industry. When I was a child I dreamt about one day becoming a biomedical engineer. And, somewhere in my mother's attic lies the remnants of that dream in the form of school papers and crayon drawings of the limbs, heads, and torsos that I one day hoped to design, engineer, and implant on human beings and animals. Aside from making me the creepiest kid in the neighborhood this also provided me with a special way of thinking about the interconnections and relationships between machines and people. That dream ultimately evaporated in college when I chose to start monetizing my software development hobby instead of completing my inorganic chemistry studies. Today however actual biomedical engineers have come one step close to the giving a sense of touch to prosthetics for humans. 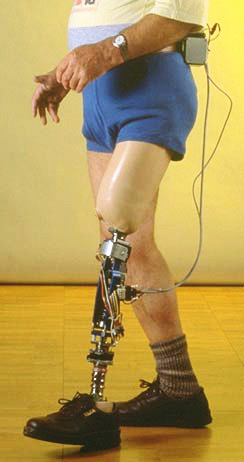 Existing robotic prostheses have limited motor control, provide no sensory feedback and can be uncomfortable to wear. In an effort to make a prosthesis that moves like a normal hand, researchers at the University of Michigan (U-M) have bioengineered a scaffold that is placed over severed nerve endings like a sleeve and could improve the function of prosthetic hands and possibly restore the sense of touch for injured patients. To overcome the limitations of existing prostheses, the U-M researchers realized a better nerve interface was needed to control the upper extremity prostheses. So they created what they called an “artificial neuromuscular junction” composed of muscle cells and a nano-sized polymer placed on a biological scaffold. Neuromuscular junctions are the body's own nerve-muscle connections that enable the brain to control muscle movement. When a hand is amputated, the nerve endings in the arm continue to sprout branches, growing a mass of nerve fibers that send flawed signals back to the brain. The bioengineered scaffold was placed over the severed nerve endings like a sleeve. The muscle cells on the scaffold and in the body bonded and the body's native nerve sprouts fed electrical impulses into the tissue, creating a stable nerve-muscle connection. In laboratory rats, the bioengineered interface relayed both motor and sensory electrical impulses and created a target for the nerve endings to grow properly. This indicates that the interface may not only improve fine motor control of prostheses, but can also relay sensory perceptions such as touch and temperature back to the brain. Laboratory rats with the interface responded to tickling of feet with appropriate motor signals to move the limb. The research project, which was funded by the Department of Defense, arose from a need for better prosthetic devices for troops wounded in Afghanistan and Iraq. The DoD and the Army have already provided $4.5 million in grants to support the research. Meanwhile, the University of Michigan research team has submitted a proposal to the Defense Advance Research Project Agency (DARPA) to begin testing the bioengineered interface in humans in three years. Humanoid robots are being developed all over the world for all sorts of purposes - but assisting the sick and elderly are two of the most popular applications. The problem is that sick and elderly people are usually confronted with robots having a cold, emotionless aura. This is where a new robot called KOBIAN comes in. KOBIAN, is being produced by Waseda University in Tokyo along with robot venture Tmsuk. They are calling KOBIAN an “emotional humanoid robot”, designed to express a total of seven different emotions including the ability to “cry”, be happy or sad, act surprised and angry, etc. It can also able walk around and move his arms and hands, too. The robot boasts an “expressive face” that is controlled by motors that can make its eyelids, lips and eyebrows move, resulting in a more human-like “behavior." It’s not able to move around autonomously yet, but the makers aim at further improving KOBIAN to make it available for use in nursing homes and hospitals. Sure, it's not uncommon to see one robot arm take a break from productivity to engage in some shenanigans potentially fraught with peril, but two robot arms slacking off and wielding weapons? Well, that's cause for some sort of celebration! As you can see in the video, however, whomever was responsible for this madness didn't completely let the arms loose on each other, which I hope means that will be coming in the "home version." Toyota Motor today unveiled a robot that can play the violin as part of its efforts to develop futuristic machines capable of assisting humans in Japan's greying society. The 1.5-metre-tall (five-foot), two-legged robot wowed onlookers with a faultless rendition of Elgar's Pomp and Circumstance. With 17 joints in its hands and arms, the robot has human-like dexterity that could be applied to helping people in the home or in nursing and medical care, the carmaker said. Toyota, which already uses industrial robots extensively in its car plants, said it aims to put robots capable of assisting humans into use by the early 2010s. The new robots come three years after Toyota unveiled a trumpet-playing robot -- its first humanoid machine -- in a bid to catch up with robot technology frontrunners such as Honda Motor Co. and Sony Corp. Makers of robots see big potential for their use in Japan, where the number of elderly people is rapidly growing, causing labour shortages in a country that strictly controls immigration. Japanese are famed for their longevity of life, with more than 30,000 people aged at least 100 years old, a trend attributed to a healthy cuisine and active lifestyle. But the ability to live longer is also presenting a headache as the country has one of the lowest birthrates. 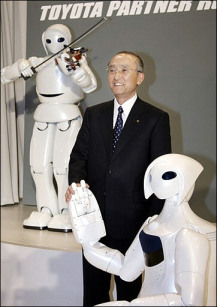 Japan's most famous robot is arguably Asimo, an astronaut-looking humanoid developed by Honda which has been hired out as an office servant and has even popped up to offer toasts at Japanese diplomatic functions. It aims to start trials putting some, including the mobility robot, into practical use in the second half of next year. Further work is also planned to improve the hand and arm flexibility of the violin-playing robot so it can use general purpose tools. Carmakers are also looking to use robot technology to develop more sophisticated cars. "Technologies used to enrich the abilities of robots can also be used to improve the functionality of automobiles," said Watanabe.